24% of respondents of the 2017 Property Investor Sentiment Survey conducted by Michael Yardney’s Property Update together with Your Investment Property Magazine said they planned to buy a new home in 2018. This is up considerably from 14% who were planning to buy a new home 12 months ago. 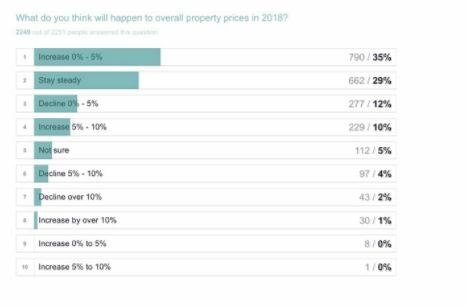 But these potential home buyers are not being unrealistic about what’s ahead for property – 64% of respondents believe that property prices will remain flat, or increase by less than 5% over the next year. Despite our property markets moving to the next phase of the cycle and property price growth slowing down, 60% believe now is a good time to buy property. “There are a number of likely reasons for this increased desire to buy a new home” said Michael Yardney, CEO of Metropole Property Strategists. “At the other end of the spectrum First Home Owner Grants and Stamp Duty concessions in several states, are encouraging greater activity by first-home buyers. “The number of first-home buyers in the past year was the highest since June 2015, according to a recent BankWest report.